As an outdoor enthusiast, gun toting war veteran, some may think it strange, but yes, even I am on the never ending quest for a bit of order, more time, and perhaps even some balance! … I phoned my friend and suggested he arrange a small get together with the three people in his office he found particularly difficult, to come play airsoft for an afternoon, and I would foot the bill. I claimed I was promoting a new leadership concept, but, in truth, I wanted to see what would happen when they were put in a situation where they were interdependent and the results were easily calculable. I’m holed out high on a bluff, watching them advance through a pair of binoculars. The advancing enemy force is unlike anything I’ve seen in my long tours abroad. They come charging in slow motion like a band of marauding Vikings, if Vikings wore flat fronts and penny loafers. Leading the charge is my friend Jim, wearing business formal in crisp dress shirt and tie, M4 held high. In fact all of them are in varying degrees of office attire. These are his workmates. I call in their positions with my radio, and my small well trained team starts suppressive fire. At the crack of gunshots their initial bravado is halted, and they scatter behind walls and barriers for cover. I make sure to let a few volleys from my heavy machine gun go over their heads. Little by little, they start to advance, providing covering fire and inching towards the center of the arena. They’re soon outmatched and outgunned. Each round that afternoon went like this. But every time they came out, they’d last a little longer, work together better, communicating and signaling each other clearly. At the end of the long day of playing airsoft, we meet and recap. The prim polished crew I said hello to that afternoon is gone. So was the initial air of tension and hostility between them. They’ve come back begrimed and ratty, scuffed and bruised, but with arms slung over each other. It’s a phenomenon that I’ve seen on the airsoft field as well as the battle field. A group starts as strangers, but they come together as teammates. Another mission successful. The lessons of cooperation and teambuilding learned in airsoft makes it a great activity for offices to participate in. I am fortunate to work in a great office at Airsplat, where we sell Airsoft guns during the week and “kill” each other on the weekends! We’re tight knit and as much friends after work as we are teammates during the day. I didn’t realize how unique my situation was until one of my friends Jim, called me to vent. One of the skirmishes at work got the best of him a couple Friday’s back and he let it all out for an hour about the inane squabbles and petty competition. One of my favorite books of all time is The Art of War. Though it is full of countless battle tactics that translate easily into life strategies, one in particular stands out to me. Sun Tzu said “If you know the enemy and know yourself, your victory will not stand in doubt.” My whole philosophy was riding on this. The slight twist in my situation was that the enemy was intangible, but equally threatening – discord. The challenge was to show these fellow office mates the benefits of communication and teamwork in a less formal environment where they could see the tangible results more readily. What this reinforced for me was that several key strategies that develop on the field also thrive in the workplace. There’s the saying “Too many cooks spoil the pot” I want to add in my own qualification by stating “Too many generals spoil the chance for victory” In an office environment, there can be constant vying for position, whether it be for a promotion, or who delegates the tasks on a project. Soon the discussion stops being about the original goal and more a battle of personalities and egos. Sun Tzu said, “he whose ranks are united in purpose will win.” In the heat of battle, where results are clear (“alive” or “dead”) leaders will naturally come to the forefront, and others follow will accede. I saw this in the first few rounds with Jim and his coworkers. I could see everyone telling everyone else what to do, each hiding behind his own piece of cover, yelling and motioning orders. Separated and vulnerable, they were quickly tagged out every single time. It was only when Jim started to take the lead position and show through his strong example that they started to stick together. With the common goal of victory at the forefront of everyone’s mind, the team will focus more on working together to win, and less about who’s leading. Another lesson from Sun Tzu that can be applied is “You will not succeed unless you have tenacity”. How easy is it to defeat an enemy that doesn’t advance, that hides behind barricades afraid of getting shot and hit? It’s startling how many stories I’ve heard of where the employees of an office are fine with just “getting by” and scowl at those individuals who work harder for everyone’s benefit. They don’t want them to ‘rock the boat’ and make everyone else look bad. In airsoft there is no “getting by” there’s just the black and white reality of ‘living’ and ‘dying’, of victory and defeat. You win and lose as a collective whole. 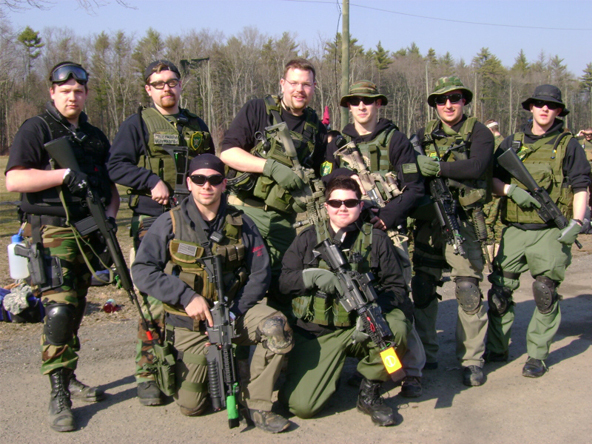 I think playing airsoft helped Jim and his coworkers understand viscerally that they’re all in the same boat, and that its ok to work hard as individuals and as a group. Though they lost every single match they played that day, they never gave up and kept hitting the battlefield with energy. Planning ahead both the navigation and the weapon choices and tactical strategy are critical for success in an airsoft game. If you don’t know where you are going and how you are getting there, if you don’t know how to defend yourself and your “plan b,” you will be taken out quickly. At work, this is just as important. Whether it is choosing a firm deadline and delivering something in time to be reviewed, or having the proper material on hand for a presentation to the board, without a strategy and a little planning, chaos will likely ensue, which typically later conveys into office disharmony. “March swiftly to places where you are not expected” The best results come from the actions that weren’t expected. In airsoft, it could be coming at the enemy from an angle they weren’t expecting, or creating impromptu camouflage from local flora. In an office this can be taking on personal side projects that weren’t asked of you, or turning in a project far in advance of schedule. Your team can stand out amongst the rest, and if its not accepted, at least it didn’t let down any expectations, because there were none to begin with! 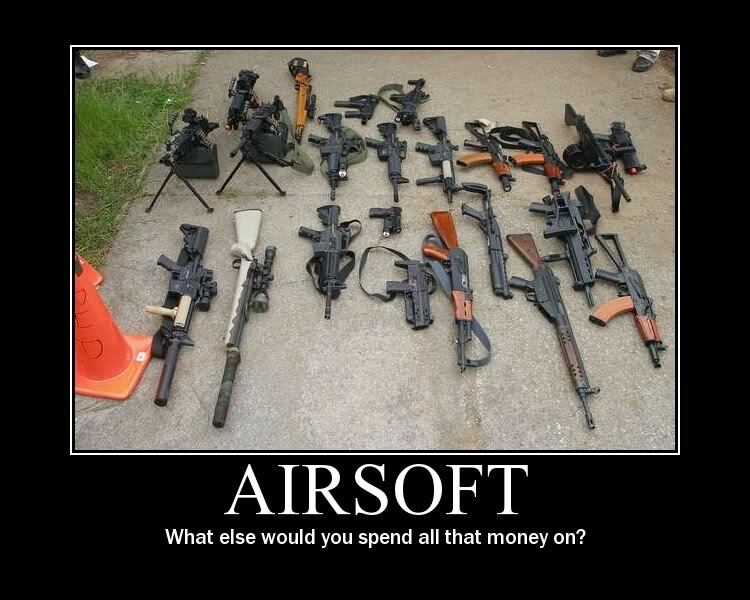 If you are interested in trying it out, Airsplat has a comprehensive listing of US Airsoft Fields, all perfect for arranging a shooting get together with your most or least favorite friends! 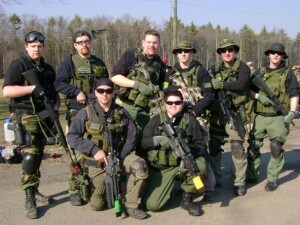 This article was written by John Durfee of Airsplat.com, the nation’s largest retailer of Airsoft guns. Thanks John for your guest article and story of how teamwork and some fun competition can really help to develop healthier working relationships and bring people together. Paintball is fairly popular in my area here in Canada, and something I’ve done with friends and colleagues a number of times. 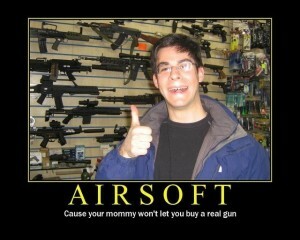 Unfortunately airsoft guns are for the most part illegal in Canada. nice display of guns there … can those guns prove to be lethal ?? i mean they are airguns isnt in ..
Sourish, I don’t think so. 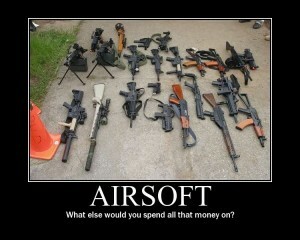 As serious as people get with airsoft and other air style of guns, it is all for competition and fun as far as I know. The fact that many are banned in Canada though might indicate otherwise, who knows. I suspect it is more because of the fact they look real, than that they behave real as a weapon. Personally I think they should not be made to look real at all and only allow the transparent ones or flourescent ones as there really is no reason to have a real looking gun unless you want it to look real as a threat. Which is a bad idea if you ask me. Nice article and nice site.